Paramilitaries “offer nothing to the local communities which they terrorise”, police in Larne have stated. The comment was made in response to a play touring youth groups in Mid and East Antrim that tells the story of a group of teenage friends who are “exposed to the “realities of paramilitaries” while growing up. 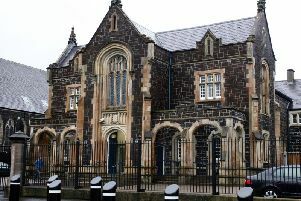 PSNI Larne said that the play entitled “Banjaxed” paints a “gritty picture, featuring punishment shootings, drug dealing and drug use”. Larne YMCA youth club hosted the play performed by the ‘Spanner in the Works’ production company. A spokesperson for PSNI Larne confirmed: “These gangs are active in Mid and East Antrim and police and National Crime Agency officers are working on a daily basis to disrupt their activities. “The term paramilitaries is outdated as they are nothing more than organised crime gangs, devoid of any ideology. “Their operations are based on control and fear, painting those who oppose them and their ill-gotten gains as touts or worse. “They offer nothing to the local communities which they terrorise. Larne YMCA said: “The play was hard-hitting but all the young people loved it and enjoyed it with some question time afterwards. Mid and East Antrim Policing and Community Safety Partnership (PCSP) in partnership with the Department of Justice, are bringing the production by “Spanner in the Works” to youth centres in the borough to raise awareness about the danger posed to children from paramilitary and organised crime groups. The play, written by Patricia Downey, is based on real life stories from children in Woodlands Juvenile Justice Centre.